An Abuja judge has been accused of committing judicial “rascality” over two different rulings given on the trial of the leader of the Indigenous People of Biafra (IPOB), Nnamdi Kanu. 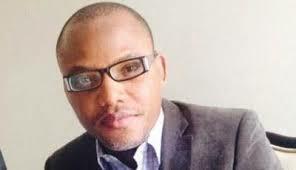 IPOB wants Nnamdi Kanu, its detained leader, released. The judge, Justice John Tsoho has been alleged to have given conflicting rulings on the same issue raised during the trial of Kanu. This is supported by true copies of the said rulings obtained by this newspaper. However, what is not in doubt is that the two rulings contradict each other and both rulings were made in the same court by the same judge. In his petition to the National Judicial Council (NJC) against Justice Tsoho, the IPOB leader, has called for an investigation into the rulings of the court over the permission granted the Department of State Services to protect its witness in his trial. In the petition written by Kanu’s lawyer, Ifeanyi Ejiofor, the IPOB leader said the conduct of the judge in the trial of his client is in fundamental breach of his judicial oath. Part of the petition read: “That on the 9th day of February, 2016, the defense was ambushed with an application filed on that day by the prosecution, seeking the court’s endorsement for secret trial of the defendants. “The defense led by chief Chuks Muoma, SAN, promptly notified the court of our intention to oppose the application, pursuant to which it was thereafter adjourned to the 19th day of February, 2016, for the hearing of the application,” the petition said. Kanu through his lawyer Ifeanyi Ejiofor had in various past interviews had said that such action by the judge can only be referred to as “judicial rascality” and shows that the judge was undoubtedly acting to a script or influenced by orders higher than himself. He also said because under the Nigerian judicial system, a court cannot alter it’s own judgement without the benefit of an appeal to a superior court. The judge’s action as evidenced by documents and the court’s contradictory rulings at our disposal goes contrary to every code of judicial conduct and ethics known to law.In the petition, Kanu also called for a correction of the “rascality” made by the judge in accordance with the Oath Act. The petition also said that several attempts by the defense team to obtain court’s rulings and proceedings of the court remained unsuccessfully until an intervention by the chief judge of the Federal High Court in the matter. It also said that Section 36(7) of the 1999 Constitution as amended allows a court or tribunal only seven days to keep its record in a criminal trial. It said: “That on the face of the application to stay further proceedings in the matter, pending the outcome of the appeal challenging the court’s variation of its order, the court would have ordinarily been spurred to br expeditious in its attention to our request. Rather, his lordship remained firm in his resolve to frustrate the defense,” the petition said. The petition noted that even the lead counsel in the matter, Chuks Muoma was shut out in an open court by Justice Tsoho from adumbrating his written brief in support of its application for stay of proceedings even when court rules allows for 20 minutes of oral argument. Some senior lawyers who spoke on the contradictory rulings said for a judge to deliver a ruling and sit on appeal over that same ruling in order to deliver another judgement beneficial to the prosecution is unheard of. The petition also highlighting series of events that occurred during the trial of Kanu stated that the judge who had earlier denied an application made by DSS counsel in what appears to be a breach of judicial oath, sat and heard an appeal against it and reversed it orders against Kanu. Justice Tsoho had on February 19, heard the application brought before the court by the prosecution. The Nigerian government through the DSS had applied to the court to seek a secret trial of Kanu among other things, where the government’s witnesses can testify and give evidence against the three defendants – Nnamdi Kanu, Benjamin Madubugwu and David Nwauwisi – by wearing a mask or hiding behind a screen/curtain. This way nobody would know who they are or where they come from.The substance of the DSS appeal is to allow the court conduct a secret trial for the accused persons. Upon hearing the arguments from the government’s prosecution team and the defence counsel Judge Tsoho ruled that the trial will not be in secret. The matter was quickly adjourned sought deals with secret to March 7, 8, 9 and 10 for commencement of full trial by the consent of the parties involved. At this point the public thought the trial will now be held in the open with witnesses coming to testify without a facial mask or hiding behind the screen. In the copy of the court ruling obtained, the order made by Judge Tsoho reads: “It is noteworthy that both parties sought to make a case as to the demeanour of witnesses during trial. There is no gainsaying that the demeanour of witnesses is very crucial in judicial proceedings and it often helps in the evaluation of evidence. “The Oxford Advance Learner’s Dictionary sixth edition defines demeanor as – the way that somebody looks or behaves. The looks of a person (facial looks) undoubtedly constitute a vital aspect of demeanor. “Therefore in a trial, the facial appearances or expression convey or reveal more about a witness than behavioral attitude. Regarding the fear expressed by the government’s prosecution team, Kanu has gathered immense support especially from Nigerians from the South East and the international community. Judge Tsoho his ruling on this very issue said: “One of the main grounds for this application is that the witnesses fear for their safety and that they have been receiving threatening calls. There has been no elaboration on this. “The supporting affidavit blandly mentioned the fear of possible attack in its paragraph 4(e).”It is paragraph 4(b) and (c) of the further affidavit that has disclosed that the witnesses have complained of receiving threatening calls and that their lives along with those of their families are in danger. “If the witnesses are not protected as sought by the applicant (DSS), it is my respectful view that sufficient particulars have not been furnished in that regard. “In any event, I hold the humble opinion that the state which is prosecuting the respondents has all the means and capability to protect the witnesses,” the judge ruled. However, upon resumption, of hearing on March 7 when Kanu with his team of counsels appeared before the court for commencement of the open trial as Judge Tsoho ordered, the prosecuting team verbally-not by written application as is normally the case – informed the court that the witnesses have refused to testify. The prosecuting team said the witnesses have said that unless the judge modifies the order he made earlier by to allow the witnesses testify secretly, they would not appear before the court. The prosecution said that the government would not proceed with the case unless the witnesses are granted the use of a mask or allowed to testify from behind a screen. This “mere” oral application to revert back to secret trial was granted by Judge Tsoho despite stiff objection by the defense team led by Chuks Muoma, a senior advocate of Nigeria. Meanwhile, it can be deduced from the charges against him that no guns were found on him. Thus arguments by several senior counsels on how he could be charged with treasonable felony without being in possession of guns or weapons. Also, senior lawyers have argued that treasonable felony as with the case of Kanu is a violent attempt to overthrow the President Muhammadu Buhari-led administration, which cannot be committed by one person. Nnamdi Kanu is currently facing trial on a three count charge of treasonable felony, management of an unlawful society and concealing goods in a container. Kanu was arrested by operatives of the DSS in Lagos upon his arrival from the United Kingdom on October 14, 2015.